Glassware clouds primarily from two things. One is a buildup of calcium and magnesium deposits left behind by hard water; the other is tiny scratches etched into the glass by a combination of soft water and harsh detergents. Etching is not reparable, so hand-wash glassware in water that has not been chemically softened. If cloudiness is the result of buildup, however, you can wash it away. 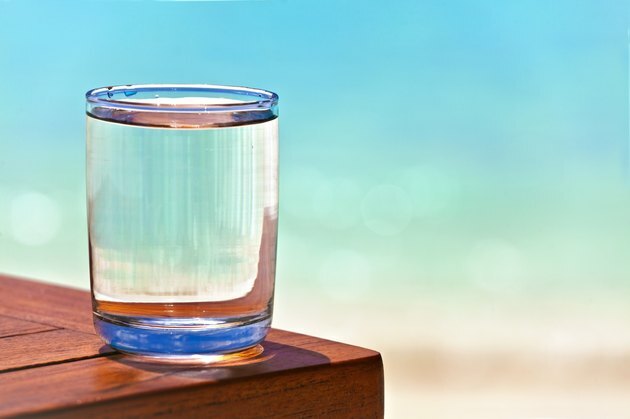 Crystal clear and clean glass of water on table. Start simple and try cleaning the piece with white vinegar. If it doesn't work, rub a coating of petroleum jelly onto the glass and let it sit for four to five days before washing it in warm soapy water. If you have a decorative piece full of nooks and crannies you can't easily reach with petroleum jelly, try soaking it in a mix of ammonia and water for a few hours. You can soak glass candleholders and other decorative pieces in the sink or fill glasses and vases with the water and ammonia mixture. Another effective calcium remover is denture cleaner. Drop a denture cleaning tablet into a container of warm water and soak the glassware in it. Specialty commercial cleansers clear cloudy glass as well.